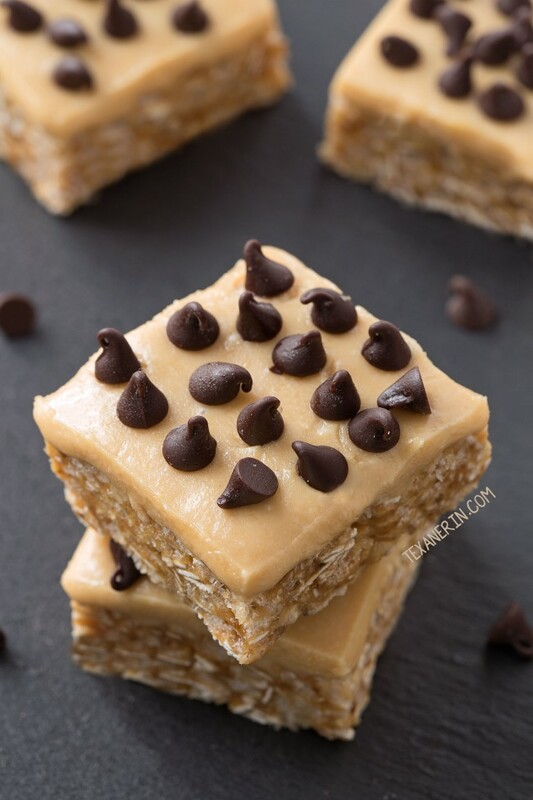 These peanut butter coconut Rice Krispie Treats have a peanut butter crisp rice base and coconut peanut butter topping that make these bars hard to resist! With gluten-free, vegan and whole grain options. 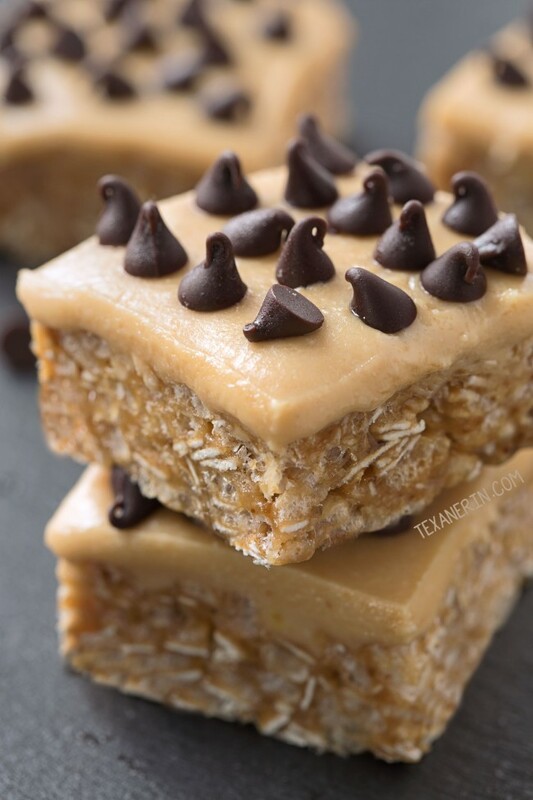 The base is similar to peanut butter Rice Krispie treats but with some oats thrown in. 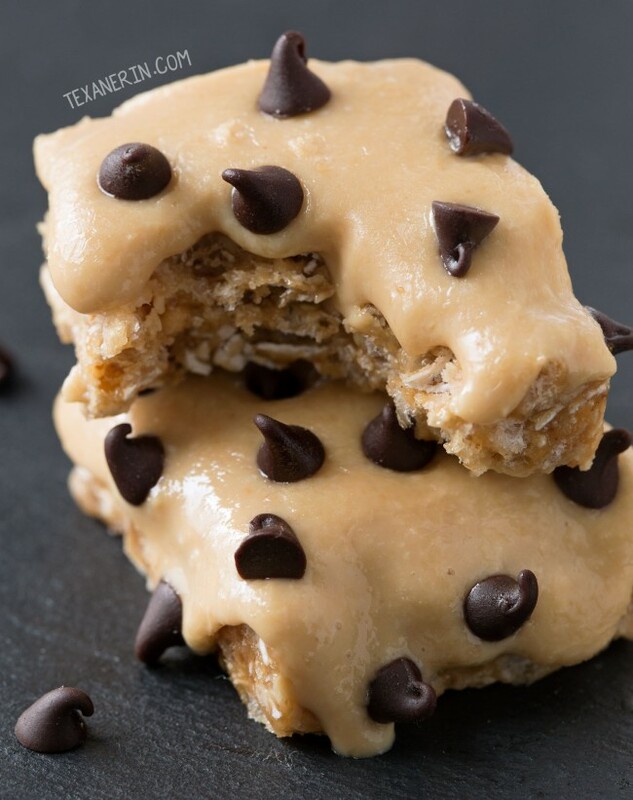 So don’t expect these to be just like regular peanut butter Rice Krispie treats! I just couldn’t think of a better name. ;) When I made these in the past, I used honey but tried brown rice syrup this time for a vegan version and they’re just as delicious! Then the topping is nothing but homemade peanut butter and coconut butter. Store bought works just as well, of course, but I prefer my more economical homemade versions. :) I want to put this topping on everything! I wish I could make a spread out of it. I’ve attempted that a few times but the problem is that it always hardens once it’s cooled. I topped them off with mini chocolate chips to make them look a little less drab but I don’t think they added much taste-wise. If you want to add chocolate, I think some melted chocolate + coconut oil would be tastier. Because of the topping, they need to be kept refrigerated. Below you can see what happens when you leave them out at room temperature for two hours. They also freeze well! Though if you freeze them, you need to defrost them for maybe 20 minutes before eating because they get almost rock hard in there. Love nut butter + coconut? Try these 3-step no-bake chocolate coconut cashew bars from Cotter Crunch! They’re also paleo + vegan. In a medium saucepan over low heat, combine the sugar, honey or brown rice syrup and peanut butter and stir until the sugar has dissolved. Remove the pan from the heat and add cereal and oats. If it's on the dry side, you may find it easiest to use your hands to combine the mixture. Press into an 8" x 8" baking pan lined with parchment paper. Mix together the melted coconut butter and peanut butter and spread over the cereal mixture. Place the pan in the fridge for about an hour or until it’s set. You can alternatively place the pan in the freezer for about 20 minutes. Refrigerate in an airtight container for up to 5 days. Can also be frozen. I recommend weighing 60 grams into a small saucepan and melting it. 60 grams of unmelted coconut butter is actually a little more than 1/4 cup. 32 comments on “Peanut Butter Coconut Rice Krispie Treats (gluten-free, vegan, whole grain options)” — Add one! Pregnant and these satisfy an after dinner craving perfectly, came together so quickly and didn’t call for the standard corn syrup like all the other recipes I saw! Didn’t have coconut butter so made a topping with cocoa, coconut oil, and maple syrup. Thanks! Can’t wait to try some more recipes from your blog! I’m happy to hear that you enjoyed them and I think your topping sounds great. 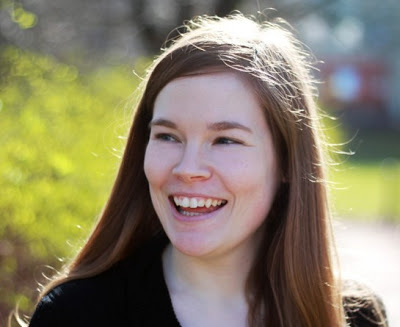 :) I hope you’ll enjoy the other recipes just as much! Thanks for your comment. Haha. Very true! ;) And thanks! These look amazing! They look better than the ones I usually make. I’m definitely going to try out your recipe and see how they go. Thanks! They make great treats for the holidays. These look great! 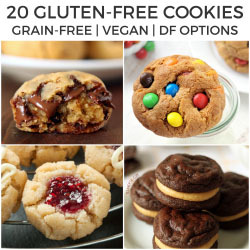 I am trying hard not to bake though at the moment so I will have to save this when I cannot control my PB cravings…they look awesome! I love the addition of the oats in the krispies. Thanks! These are perfect for those moments. ;) And so easily halved if you just want a little. I hope you’ll enjoy them! I would definitely need to share these with multiple friends so I didn’t eat the whole pan myself. What an awesome treat! Homemade healthy rice krispie treats? I think I just died and went to heaven! Theses look HEAVENLY! These krispie treats look fantastic! I love how quick and easy they are! Thanks for the gluten free version! These bars look heavenly! I’m not a big fan of coconut butter, but maybe with some peanut butter it’ll be more palatable for me. :) I’ll have to give it a try! I need to start making more fun rice krispie treats like this one! These look amazing! Oh these look like the perfect treat! Oh my gosh, these sound amazing. I have a thing for brown rice syrup (I could eat it with a spoon), so I was sold right there. But I also love the look of the texture of the base. Yum! Haha. What?! I never even thought to taste it. I have to try that now! The PB coconut topping sounds so intriguing! I need to make these! These rice krispie treats look amazing! What a treat to use homemade peanut butter and coconut butter! I’ll have to check out that Bon Recipé too, looks like a great deal!